H. Moser, Paris, by whom acquired from the above in October 1938. Galerie Durand-Ruel, New York (no. 5509), by whom acquired from the above on 20 January 1944. Private collection, and thence by descent to the present owner. Exh. cat., Renoir's Portraits: Impressions of an Age, Ottawa, 1997 (illustrated p. 340, fig. 310). Munich, Haus der Kunst, 19. Jahrhundert, October - January 1965, no. 224. Paris, Galerie Durand-Ruel, Renoir intime, January - February 1969, no. 50. Tokyo, Isetan Museum of Art, Exposition Renoir, September - November 1979, no. 74 (illustrated); this exhibition later travelled to Kyoto, Municipal Museum, November - December 1979. When writing his memoirs of his father, the legendary French film director Jean Renoir recalled in particular an idyllic summer spent with 'our friends the Thurneyssens' (J. Renoir, Renoir, My Father, trans. R. & D. Weaver, London, 1962, p. 373). This was in 1910, and marked Renoir's only voyage abroad in the Twentieth Century, a tribute to the lure that the Thurneyssens exerted upon him. The friendship had begun two years earlier in Cagnes, where the Thurneyssens were staying and on which occasion Renoir painted his Portrait de Madame Thurneyssen. This picture, then, marks the beginning of a friendship that was to have a great bearing on the life of Renoir in the Twentieth Century. Within only a handful of years, no less an authority than Julius Meier-Graefe stated that Dr. Fritz Thurneyssen, the present sitter's husband, possessed one of the two most important collections of late Renoir in the world. Amongst the number of works that this collector had accumulated were several showing his family: another later portrait of his wife, in this case holding her infant daughter (though the daughter looks old enough for her mother's partially exposed breast to appear of interest not in a maternal context), as well as two paintings of her son Alexander, the second of which is an extravagant and intriguing work depicting him, with all his ringlets, reclining as a classical shepherd. The Thurneyssens, as can be seen both from the above-mentioned works and from extant photographs, were a good-looking family, and Renoir celebrated their good looks in all of these works. Mme Thurneyssen in particular appears to conform to the artist's own concepts of feminine beauty, with her rounded figure and her blooming aura of health. The painter's palpable enthusiasm for his subject has resulted in this becoming not a mere portrait but instead a rich and absorbing portrayal of womanhood. The various roses that adorn the hair and clothing of Mme. Thurneyssen lend the painting an abundant sense of femininity, as is only too suited to the charms of the sitter. These flowers evoke a fragrant atmosphere of fertility while also picking out the pink of her almost glowing skin. Renoir has openly relished depicting the warm tones of the expanses of skin that her face, arms and most importantly her chest reveal. Her costume, which appears modest and approaches the classical, has a hint of the diaphanous, but is deliberately left understated, demanding that the viewer focus on the features, the flesh and in particular the generous chest of the sitter herself. The formality of the pose, heightened by the sturdy chair upon which the sitter is shown, is reminiscent as much of Old Master portraits as of those of the early nineteenth-century French painters such as Ingres and David. Yet this formality has been deliberately softened by the flowing, many-layered gowns; at the same time, this deliberate reference to a formal pose is off-set by the informally-held hands and, indeed, by the entire atmosphere of her character. Dr. Fritz Thurneyssen was a man of great learning and charm, and also of relative leisure, allowing him to develop a deep knowledge of art and of various other subjects. He appears to have inherited some wealth from his family's chemical company. This wealth was obviously great enough to excite some of the dealers of the day, not least Vollard, who even noted in his correspondence that Thurneyssen was happily acquiring a taste for 'modern art'. This taste was evidently refined: as well as the selection of Renoirs deemed of such note by Meier-Graff, he appears to have owned works by Cézanne and Degas. His circle of friends appears also to have included gifted and entertaining figures within its number, a factor that doubtless made Renoir's stay with him in Bavaria all the more pleasurable. It is of interest to note that Thurneyssen himself was clearly held in some respect by Renoir, as was reflected by his ability to negotiate a donation by the artist of a significant painting to Munich's Neue Pinakothek. This appears also to have been a repayment on the artist's part for the experience of viewing the magnificent Rubens oils in the Alte Pinakothek. For some time, it was a common misconception to confuse Barbara, or 'Betty', Thurneyssen with another family of the same name with whom Renoir was also linked, for the niece of arguably Renoir's greatest patron, Paul Berard, had married a Frenchman of that name (in fact, Colonel Albert Thurneyssen-- coincidentally, Dr. Fritz's middle name was also Albert); several catalogues and books of Renoir's life would place him as their guest for his Bavarian holiday, perpetuating the same error, thoroughly dismissed and explained in the exhibition catalogue Renoir's Portraits: Impressions of an Age of 1997 and 1998. It is a mark of how the Thurneyssens managed to keep a low profile that this mistaken attribution lasted for so many years, especially considering the fact that Fritz died after the end of the Second World War. 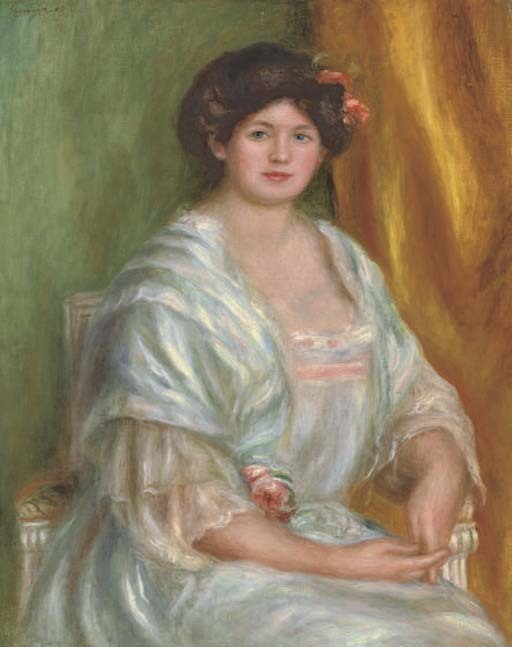 Portrait de Madame Thurneyssen was painted at a vital moment in the later stage of Renoir's life: it was during this period in Cagnes that he was building his own home, having rented properties each previous year that he had visited. His success meant that he could now oversee the construction of a home large enough to include studio facilities, rooms for guests and for his entourage of staff, and with a view worthy of such an artist. It was during the autumn of 1908 that he finally managed to move into the new home, leaving one to wonder whether this picture was painted against a backdrop of the final preparations, or whether it was one of the first works to be finished in the new property. This house would come to eclipse Paris in its centrality to his life and would be his base for the rest of his life, where he would famously hold court, accepting visits from young artists from Matisse to Modigliani and dispensing his wisdom, where it was accepted. Please note that this painting will be included in the forthcoming Renoir catalogue critique being prepared by the Wildenstein Institute and established from the archive funds of François Daulte, Durand-Ruel, Venturi, Vollard and Wildenstein. We are grateful to Guy-Patrice and Michel Dauberville for confirming that this picture is included in their Bernheim-Jeune archives as an authentic work.